Wow, where to start...today Sunim and I went to Future Shop here, to acquire the pre-paid phone for him, (thanks to Dave Pope for setting that up!). The clerk was pretty new, so it took some time to get the phone set up. I hope it serves him well on his travels. Then we tried an ATM at the nearest bank, so he could get some cash, and for some reason it would not accept his card. We were hungry so we went for lunch. He really enjoyed the Pho (vietnamese soup). We then stopped at another ATM machine, and SUCCESS !!! He was so happy it worked!!! He said he had been worried all through lunch about getting money if his card was not working. But it all worked out! We then went back to his host's house, and he showed me some pics of his wood carving hobby on his notebook. I showed a book to Sunim, that my friend and fellow Buddhist, John McCaffrey, of Ottawa, had sent me, and Sunim knew about the author, and told me it was a very good book. Thanks John! I will read it again! Sunim talked about "karmic affinity" and a few other words from the book. Then I very reluctantly said my goodbyes, he gave me a hug, said he would send me a wood carving in a few years! When I arrived home, there was message for me from Janet Stewart, reporter from the CBC, where Robert works, and they may do a news story on Sunim's adventure!!!! So, WOW, it has been quite a day so far! 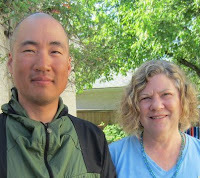 Robert, Sunim's host, is planning on driving Sunim east tonight, to the Whiteshell, and Sunim will leave from there in the morning, en-route to Kenora. I so look forward to seeing online the next parts of Daeung Sunim's adventure.